We have been traveling along the first nine sites of the Hudson River School of Art Trail. This has been taking us to various locations where the great 19th Century landscape artists once stood and conceived many of their works. The trail was sponsored and implemented by Cedar Grove, the Thomas Cole National Historic Site. Our goal has been to demonstrate that each of these sites, renowned for its scenic beauty, was the direct result of ice age events that occurred perhaps 20,000 years ago. We have been arguing that it was the ice that sculpted the beauty that those artists painted. Today we have arrived at site number eight, the great ledge where the famed Catskill Mountain House Hotel once stood. 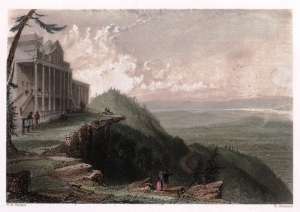 Thomas Cole stayed there on his first visit to the Catskills in the autumn of 1825. From the hotel he went exploring the wilderness of South Mountain. He sketched what he saw, and turned those sketches into canvases that began the Hudson River School of Art. If you visit the site today, you will find that the hotel is long gone, burned to the ground about a half century ago: arson by agents of the Department of Environmental Conservation (DEC). The ledge remains, and it must look much as it did before the Hotel was built. It forms a massive cliff of Catskill bluestone that commands a 70 mile panorama of the Hudson Valley. What did the Ice Age have to do with this mass of rock? We must find out. We take a mind’s eye journey into the deep past. We travel through time until we arrive at the very moment when the glaciers were just about ready to overwhelm the Mountain House ledge. We are now standing on the very same sandstones, but we have gone roughly 20,000 years into the past. The Ice Age has been underway for several millennia now, and a great glacier has almost filled the Hudson Valley. Surprisingly, the ledge sticks out perhaps 15 feet farther into the valley than it did when we left modern times. We walk out those extra 15 feet and stand on what is for us a new edge of the cliff. Immediately before us is the glacier. It is past sunset on an April 3rd and so it’s now completely dark. We can’t see very far out onto the ice. But we can hear it. This ice age version of spring has been relatively warm and that has accelerated the southward flow of the ice. As the brittle ice lurches forward, it generates quite a racket of groans, cracks, and pops. It is tonight, a very active and noisy glacier. Now a dim glow appears across the valley. It’s a nearly full moon, about to rise above the Taconic Mountains. Its brilliant sheen creates a silhouette above the profile of those otherwise black mountains. The moon bursts above the highest peak and shines down upon the now moonlit valley glacier. We turn around and look up toward the slopes of an equally illuminated South Mountain. They are blanketed with new snow. Poking through that snow are the stumps of ancient trees. There had been a forest here before the ice age. Those trees all died and only these stumps remain as a testament of the dense woodland that was once here. We look up and see snow covered slopes shimmering with a silvery luster, created by the moonlight. It is a most impressive vision; we recognize how fortunate we are to witness this. We are drawn upwards; we start an ascent of South Mountain. After climbing a few hundred feet, we turn around and look down into the valley again. Now we really can survey all that is before us. An ice age midnight approaches, and the moon is high in the sky. Its brilliance lights up the ice all across the valley. The silvery gleam of the glacier is broken by great jet black fractures. These are the enormous crevasses that form in a valley glacier while, like tonight, it is actively moving. The brittle ice cannot bend; any stresses within it result in great fractures. These occur from time to time, and they generate the very loud cracking sounds that sporadically echo off the mountain slopes. But suddenly we hear something far louder. The advancing ice has formed a tight bond with the Mountain House ledge bedrock. That has generated stresses that eventually cannot be resisted. The moving ice has just ripped loose an enormous mass of rock, 15 feet of it. We have witnessed the violent formation of the modern Mountain House ledge, the ledge that attracted so many artists. But, none of them ever painted this scene.